Learn the groundwork of the mechanical and electrical engineering fields from the ground up. This program prepares students to apply basic engineering principles and technical skills in both the mechanical and electrical fields. 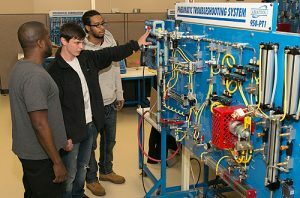 Students study the design, development and testing of electromechanical devices and systems such as automatic control systems, servomechanisms, motor controls, electronic controls, and related system trainers. This program supports students who plan on continuing to study mechanical and electrical engineering.